HAMILTON - Kent Austin dismissed allegations from Saskatchewan Roughriders head coach/GM Chris Jones that the Hamilton Tiger-Cats used insider information prior to their meeting earlier this month. On Tuesday, Jones said the Riders will hold closed practices for the remainder of the season after accusing the Ticats of spying prior to their regular-season matchup. Saskatchewan beat Hamilton 37-20 on July 8 for its first win of the year. 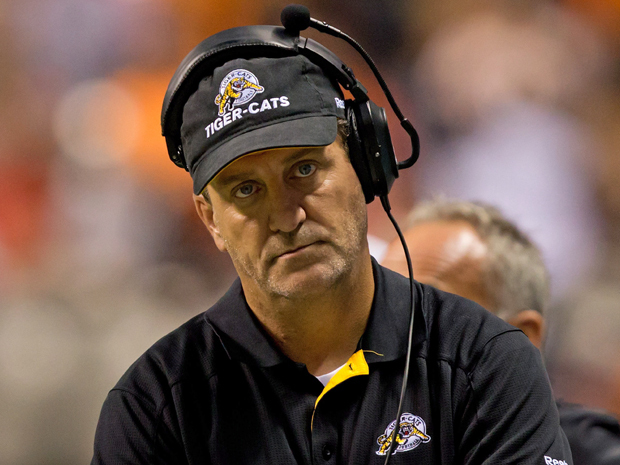 The Ticats (0-3) remain winless. "Oh, Chris, yeah, good old Chris,'' Austin, Hamilton's head coach and vice-president of football operations, said Wednesday. "That's, quite frankly, absurd. CFL rules permit teams to old one closed practice per week. Jones was particularly concerned about a specific special teams play in the game, where he felt the Ticats reacted uncharacteristically quickly to Saskatchewan's formation. But Austin said if the Ticats we're spying, he would have expected a better result. "It didn't work out too well for us except for that play, huh? If we were doing that, I'd need to fire the scouts,'' he said. The "Sk. Football God Mr. Kent Austin" has spoken. And so it shall be and come pass as thy will be the end of subject time emortal, amen. Talk about a silly non-story! Must be something of more substance going on in the CFL these days! Austin and his players have tried to bully the League and it's officials for quite some time. Their suspensions (both Austin and players) for contact with officials is living proof. These along with various other violations shown what disdain the man has for everything that is not by his gospel. The guy is turning into pure scum. He for all the hype when he came back to the CFL a complete and utter failure. No Grey Cups whatsoever and a team is decline because unlike Jones, nobody much wants to play for the guy and certainly nobody stays there. If the idiots were to note nowhere does he say that he didn't do it. He says things like absurd, ridiculous and a few other adjectives but he doesn't come right out and deny it's truthfulness. That's because it's quite likely true, and the enlightened know it to be so. Austin's team and direction are going nowhere. It's quite likely that changes will be made in Hamilton once they realize they were sold a bill of goods.His Grey Cup win in 2007 had more to do with other factors like Roy Shivers and the fact Winnipeg suffered a loss of their staring QB. Austin had little to do with it. Buono has forgot more about winning than Austin will ever know. Honestly I wish Chris Jones would stay completely focused on the franchise he works for. When Chris comments on other teams players or their staff. He honestly sounds a little ridiculous by saying things he has no proof of. He's going on a whim which makes him sound under qualified as a GM. This comment on Hamilton is a real stretch. I personally don't believe it and it makes me think of fake news. Or better yet that Chris Jones is sounding more like Donald Trump. I was embarrassed as a Rider fan last year on several occasions. I had hoped Jones had realized just how bad he looked and sounded in 2016 and would stop in 2017. Dosent seem to be the case. So as a fan base asking you Chris. Can you please stop all the rhetoric and makes us a proud franchise once again. PLEASE! First commenter, not most, you speak for a vocal, over reacting minority. And did everyone expect Austin to say, yup, busted, you caught me. I like how you failed to mention that we won the 2007 Grey Cup being the most injured team in the league that year and having lost the most man games to injury. To say their QB was injured is lame as we were without many of our top guys as well. Nice way to spin it though! A lot of comments on the past few articles calling the Riders bottom feeders or basement dwellers or the above comment of toilet bowl. People are quick to criticize and love to pile on a losing franchise. You don't read this same junk regarding Toronto or Montreal this year. When in fact they had the same record as SK last year. Hamilton was in the Playoffs last season. So they have lost 3 games to start this year. Big deal! There is no proof they are what Joe Scmo states above as the toilet bowl. What a lot of these simpletons forget is that the CFL has seen many teams turn around from last place to serious contenders in 1 off season. The Riders are 1-2 and could easily be 3-0 right now. They have not been outplayed. Even the game against Winnipeg. The Riders were the better team. A few misunderstood busted coverages cost them that game. Jones system was far too involved so early in the season. He simplified it and they were able to not only beat Hamilton they crushed them. Only allowing 1 TD against the defence. Watch for the Riders to be right in the thick of things for a Western playoff spot this season. I hope that when they squeak out a victory in Calgary. People will sit up and take notice. I will retract all of this if Calgary was to hang a licking on them. I don't think that will be the case. Let's all watch and see! Spy or no spy players have to make plays on the field. Dickinson is holding closed practise as well. Seriously some of the issues that come up are like kids on the playground. Just play football that is enjoyable to watch and maintains the integrity of the CFL. Some days it's hard to be proud of this league. Congrats to Nik Lewis on 1000 catch milestone, don't always like the guy but surviving in the league for this long warrants mentioning. Austin did take them to 2 grey cups in his first 2 years. That's not too bad. The regime before him never did that. Some of their recent player changes are head scratching though. The team is worse for sure than last year. so Hamilton guessed right on one play in a game they lost and your coach is accusing them of spying? either the CFL is more of a joke than we all think or Jones is the worst liar in history. the real question here is who cares? same garbage teams, same bad players and coaches and same half wit radio guys. the next original idea in that league will be the first. does jones think he is re-inventing football? wait maybe with that ego he actually does think that. Unlike Jones, nobody wants to play for Austin, Anon #4????? Jones has burned bridges with a lot of guys in this league. Do you think Durant, Lemon, Capicciotti, Chick, Dressler, Getzlaf, Chambers, Nichols, Newsome etc etc etc would play for Jones again? All the players come in with great press clippings only to be dissed by Jones when they're gone. Go back to when Lemon & Capicciotti arrived & attended functions on the Rider behalf & Jones lauded them as the new faces of the franchise - the 2 big signings out of 2016. There's a lot of guys that won't play for Jones. Notice how much ink was given to how Eskimo players would follow Jones to Regina? Well, Andrew Jones, Lawrence, Chambers & Foster were the only FA's who came......and went. The big FA fish available in 2016 - Sewell, Bowman, Sherritt, White to name a few stayed put. Jones ability to bring players is overrated &, with every loss, less & less likely to happen. Good, then we can bring him here, to sask. And get rid of jones. And we will have a winner again . He will find the missing parts. He can bring Tillman back to.